The Ultimate One-Stop Guide for DIY Spa Birthday Party Ideas! Hi Friends! Every few years I host a big fun party for my kids, especially for their milestone birthdays. For my daughter’s 10th birthday we went a little crazy and had a fabulous DIY spa party. It took a few months of prep work and researching at home spa party ideas but it was worth it. Everything came out better than expected! Scroll on through to check out a ton of DIY spa birthday party ideas! I bought some brown fabric and tulle in the 50% off Remnants at Joann’s so they only cost me a few dollars. I cut it in half and hung them from the ceiling in my family room and the other in the dining room. Then I tied them will some pink satin fabric. I bought a few pink and brown paper lanterns to hang along with some homemade tissue paper flowers and balloons. I made the “Buchanan’s Chocolate Day Spa” sign with my Cricut Explore Air™ and taped it on the front door. I also cut out vinyl (found here!) with my Cricut that said “Relax, Refresh, Unwind” and hung applied it to my mantle (not the permanent kind! This stuff came right off after the party). The part that took the longest was making each girl their own personalized towel wrap. I embroidered their first initial on the bottom. This was a little tricky since my daughter is on the smaller side so it was hard to estimate how big to make the towel wraps. I just bought cheap brown towels from Walmart and my daughter picked out some fabric from Joann’s, we had half pink and brown polka dot and half blue with polka dots. The tutorials I followed for the DIY bath towel wraps are found here and here. I also made a personalized organizer for all the girls. I found these pink hanging organizers on clearance at Target for $0.20 each!!! Major score!! I just happened to see them one day in their Spot Bins up front. I cut out each girls name out of vinyl with my Cricut and applied it to the top section. We filled each with a nail polish, emory board, lotion, high heel cork board (another Target clearance item), and then I also made all of them matching sleep masks. Most of these items were from the Dollar Store. They were all hanging up waiting for the girls as the arrived. For the cake, I made one that looked like a bottle of nail polish. I topped a few 8 inch cakes on top of each other and used a pringle can covered with brown cardstock on top. We of course had a chocolate fountain since it was a chocolate spa party! The girls loved this! We put out pretzels, strawberries, marshmallows to dip into it. These are the different activities and stations we had at the party. I paid our babysitter and a friend of hers to come over and help out. They did the makeup and hair station. My mom always comes help me out and she did the nail station! I kept emptying the water at the pedi station and helped them make lip gloss. Then they put the masks on! It was so funny, they were freaking out and it was great to watch. I had made all of the them personalized pillows with iron on vinyl(found here) and set them out on top of some blankets on the ground. After they had the masks on, they laid down on their pillows with cucumbers on their eyes while we played relaxing music . After they all washed their faces off using the washcloth, they moved through the following stations: Hair Station, Make-up Station, Mani Station, Pedi/Foot Soak station, and make your own lip gloss station. I made cute signs for all of them with my Cricut Explore Air™ and set them up in different parts of the room. There were also Discovery Girl magazines for them to look at while they got their hair done and rainbow looms out to play with. As you can gather, I use my Cricut a lot!! It is such an amazing machine! Check out my Cricut Explore review by clicking here! After all the stations, the girls ate dinner and then watched a movie. My mom and I were exhausted but we got up with them in the am and made them all breakfast too! It was a very fun party and everyone really enjoyed it and hope you did too! A few years later, we hosted a fun Baking Birthday party! Click here to check out some ideas for a baking party!! Thanks for stopping by! 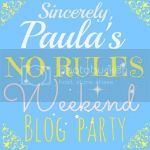 I hope you got some great spa birthday party ideas that you can use! Have a great day! Want to save these ideas for later? PIN it now!